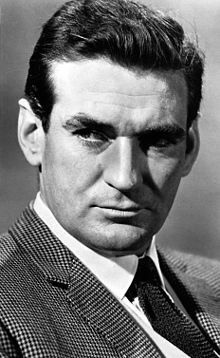 Rodney Sturt "Rod" Taylor (11 January 1930 – 7 January 2015) was an Australian actor of movie and television. He appeared in over 50 movies, including leading roles in The Time Machine, Seven Seas to Calais, The Birds, Sunday in New York, Young Cassidy, Dark of the Sun, The Liquidator, and The Train Robbers. Taylor suffered a heart attack and died on 7 January 2015 in Los Angeles, California, United States, at the age of 84. ↑ "Rod Taylor, 'The Birds' and 'The Time Machine' Star, Dies at 84". Variety. 8 January 2015. Retrieved 8 January 2015. This page was last changed on 5 December 2017, at 19:00.